Come ‘round the campfire and I’ll tell ya’ a story. You see that-there Greendell Mulch store? Legend has it that ‘round back is a seven-acre corn maze—harmless enough by day. Small kids can walk through it, finding their way through the path by answering trivia questions. But after dark… All through October, by the light of the moon, the corn maze turns haunted! And that’s not all. They say that-there mulch store takes people away on haunted hay rides, dragging victims by the hundreds to the trailer of terror. No sir, unless you’re looking for lots of scares and excitement, I’d stay well-clear of that-there mulch store in October after dark! 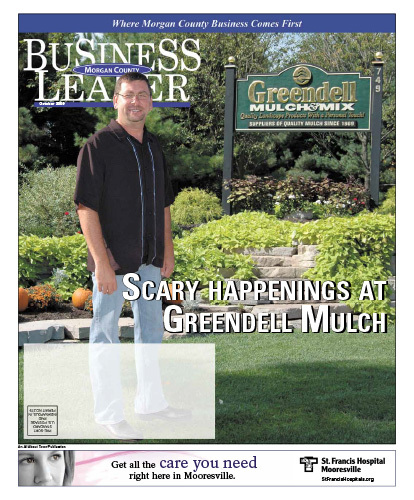 This year Greendell Mulch will open their seven-acre corn maze during daylight hours for an amazing family adventure. They grow their own pumpkins in their fouracre pumpkin patch. Parents and kids can enjoy a tractor-pulled hayride on their way out to the maze and pumpkin patch, where kids pick their own pumpkin for Halloween. After dark each Friday and Saturday starting October 9 until the end of the month, everything changes. Dare you allow the haunted hayride to take you away to the “By the Light of the Moon” Haunted Corn Maze? How about the haunted trail winding through the woods and leading you to the “Trailer of Terror?” Every year, these afterhours scares are a huge draw for older kids, teens, parents and the young-at-heart. If you lose your nerve, the ghosts and ghouls will point you to the “chicken trail,” which allows you to flee with your tail between your legs in time to endure the jeers of your less-cowardly peers. Download the full October 2009 Edition here.